A dystopia (from the Greek δυσ- and τόπος, alternatively, cacotopia, kakotopia, or anti-utopia) is a community or society that is in some important way undesirable or frightening. It is literally translated as "not-good place", an antonym of utopia. Think more end of the world, the end of time and a story unraveling from a tragedy. This type of literature may not be for everyone but it did perk my interest and I'm here to tell you my thoughts on this novel! When first reading you learn a lot about the main characters Selah and Bodhi. You will enjoy following them along their journey in this book, its a hard one to put down! Has the feel of a lot of the Young Adult fiction that is out now, think Hunger Games and Divergent. We are 150 years after the "Time of Sorrows" on the East Coast in the United States. The earth was attacked by nuclear war which resulted in major weather implications of catastrophic measures (volcanoes/tsunamis). Selah is almost an adult and will have to find her mission in life, is it to be married to one she does not wish to be with or set forth on another mission? When she discovers a "Lander" named Bodhi everything changes, her life is thrown into chaos upon her discovery and her journey begins. You will be enthralled by Thunder and craving for more as do I! I can't wait for the next book in the series, I'm hoping for all of my unanswered questions to be revealed. Who are the Landers? 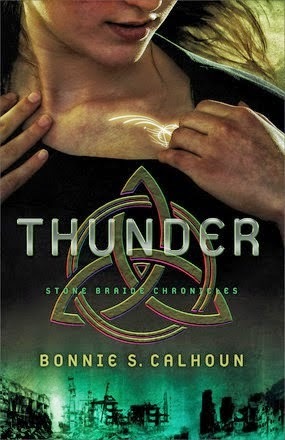 We will hopefully find out much more in the 2nd Stone Braid Chronicles Book "Lightning", later on Fall of 2015! You can purchase this great new book at Family Christian. I would by more decorations. I would buy some music or books. I love the retro cookie jar. They have such cute home items! I would like to get the NIV/The Message Parallel Personal Size Study Bible - Numbered Edition. I would buy some music or piano/songbooks. You can never have too much music! I'd buy a One Girl Nation CD.